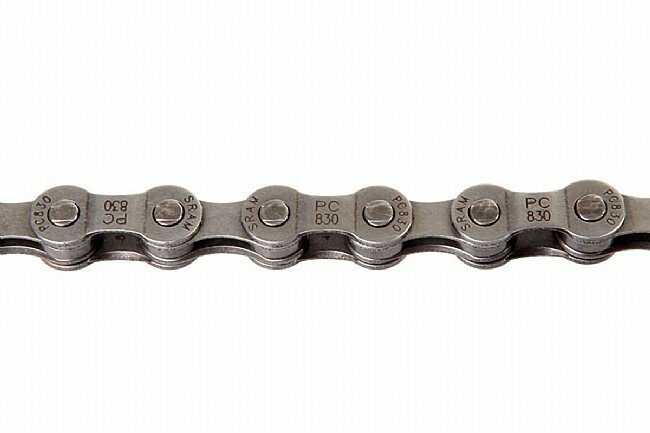 The PC-830 is a reliable budget-priced chain for 6, 7, and 8-speed drivetrains. SRAM's StepRiveting process increases strength between plates. Powerlink tool-free connector included. Grey. I use this chain on a single speedfixed gear bike and it's been great after much abuse. Great replacement I use for most repairs without getting fancy. Shop stocks these for 21spd,7-8 spd cassette. They shift as well as the upper end chains. Kept lubed will last a year or more. Strong quick shifts, climbs gears well. Drops down and engages good. While refreshing a 1993 Marin Mtn bike, I was pleasantly surprised at the price of an 8 speed chain (compared to 11 speed). So far so good and I expect this to run a long time with normal maintenance. I had a chip on my shoulder about master link style chains. I bit the bullet and bought this one and now I'm convinced, master link technology has grown up and is ready for prime time. This chain installed quickly, is exceedingly smooth and unlike chains you have to drive the pin in with a tool, you DONT have to worry about a stuck link! It's always the right tension. Put the ends together, snap them together, and you're done. All I could ask for and more. Replaced the chain on my wife's bike, she was amazed at how much it improved shifting. Win!